This Power distribution board is designed to replace the main plate on the H250 Mini Quadcopter Frame. It has various solder pads to make sure that your mini quad build looks neat and tidy, no more will there be scraggily ESC leads floating around just itching to be caught a sliced apart by a props as this board routes everything through printed copper traces so that they re-emerge exactly where you need them. This supports layouts for both the CC3D Evo and Naze32 flight controllers so that all you have to do is solder on the pin headers required and “plug in” your flight controller. 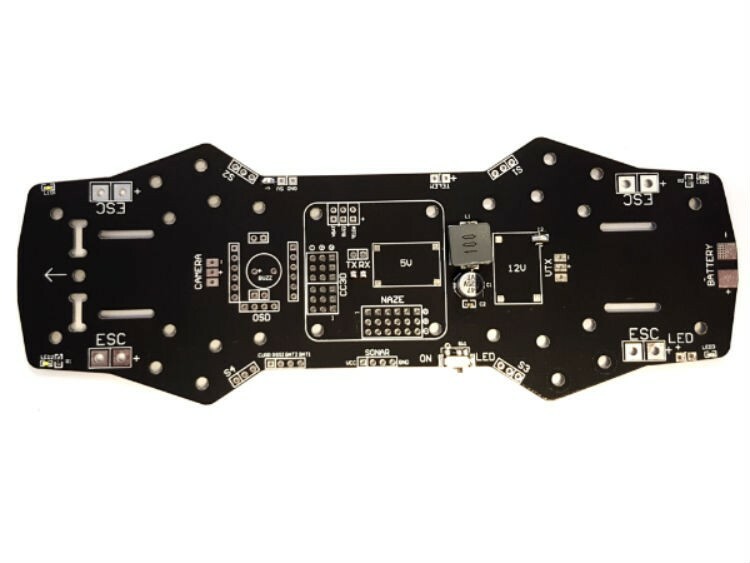 Because this board is designed for an FPV frame it has been designed to accommodate your FPV gear so this has all the pads required to solder an OSD such as the Micro MiniM OSD, flight camera such as Fatshark 900TVL 16:9 and video transmitter such as the Lumenier 600mW raceband VTx. The board comes with both 5V and 12V voltage regulators so that you can power your flight controller and any other accessories that need 5V without the need for BECs in the ESCs. Anything that needs a 12V supply can also be catered for however if you don’t need 12V then just don’t solder the regulator to the board which allows you to save space. Please Note: The jumper I2 (next to 12 reg position) is solder in the closed position, this will supply the board with LiPo power to camera, VTX at full lipo voltage. Please remove jumper if you require lower voltage with systems you are installing.